My sister Beth and her husband Warren left Fort Myers Beach early this morning. They are heading to Charlotte NC to spend the holidays with their daughter and reunite Warren with his two beloved cats, George and Chaney. While they were here, we kept very busy visiting the Everglades, Cape Coral, Six-Mile Cypress Slough, Harns Marsh, Little Estero, Audubon's Corkscrew Swamp, Naples, the Ding Darling National Preserve (twice); enjoying the sun and surf on the Fort Myers beach by their apartment; and, shelling on Sanibel and Lover's Key (twice). We enjoyed Bill's cooking, eating till we could eat no more; talked non-stop, laughed till we cried, walked the trails, beaches and boardwalks till our legs, backs and bladders gave-out and shared the wonders of this beautiful area. 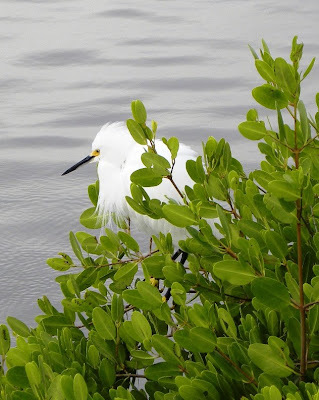 Beth saw her first ever Manatees at Lover's Key, Burrowing "They are so-o-o adorable" Owls on Cape Coral, Apple Kites and a Limpkin at Harns Marsh, plovers at Estero and Sandhill Cranes near Corkscrew. It was a wonderful time, but we've been so busy that I am way behind in my blogging. 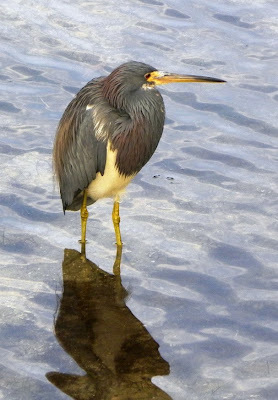 An especially beautiful Tricolored Heron. 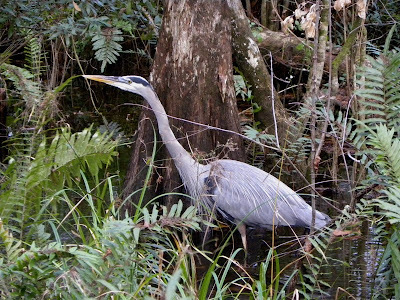 There are three major types of blue-colored herons; Great Blue, standing over 4-feet tall; Little Blue, at a little over 2-feet; and Tricolored, which are about the same size as the Little Blues. This Snowy Egret was standing by the edge of the water at Ding Darling waiting for some small fish to swim by. The common white birds include the small Cattle, yellow-footed Snowy and the large, graceful Great Egret. On Sunday, we arrived at Ding Darling when the gates opened at 7 a.m. 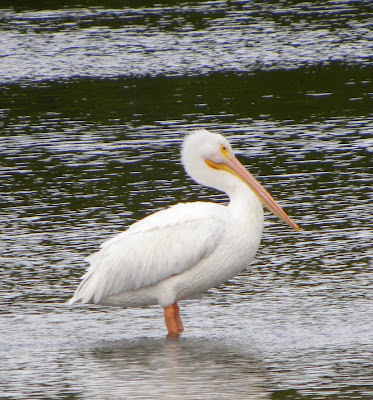 The White Pelicans were actually moving around looking for food instead of sleeping and preening like they are usually doing when we do the nature trail later in the day. This one stopped long enough that I could get his picture. 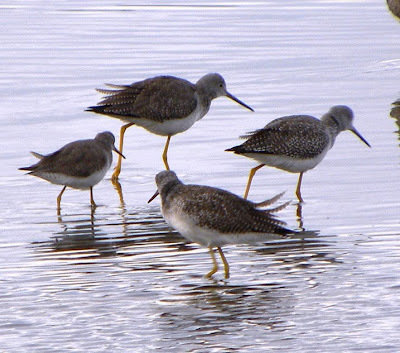 Beth and I decided these were Lesser Yellowlegs - because, obviously, they have yellow legs. 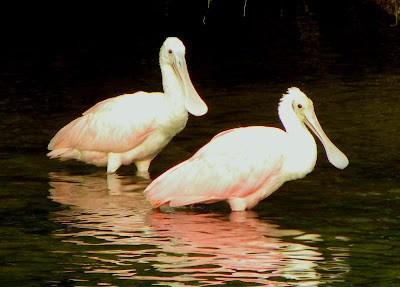 Neither of us noticed them on the sandbar with the pelicans until we checked our pictures later. 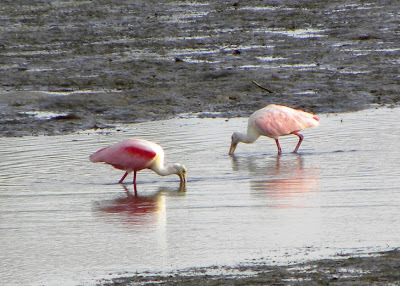 Our favorite birds - Roseate Spoonbills. This is a breeding adult (with the red on his/her wings) and four fluffy juveniles. They look like they are smiling! One of the youngsters. Look at that bill! There were quite a few Blue-winged Teal swimming around looking for food. The bird in the middle is another Yellowleg. I'm still not exactly sure what this is. 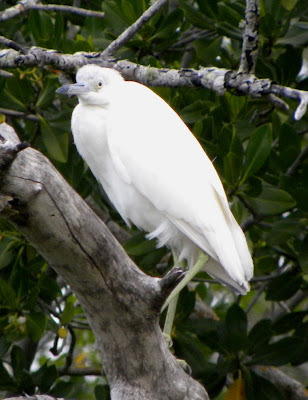 He was sitting in a tree with two adult Great (white) Egrets - but the juveniles look like their parents - so I ruled that out. He was smaller than the other two birds - and all white. I decided he is an immature Little Blue Heron - but would happily consider other suggestions. After a couple of hours on the wildlife drive at Ding Darling, Beth and I went to Bowman's Beach on Sanibel to do some power shelling. 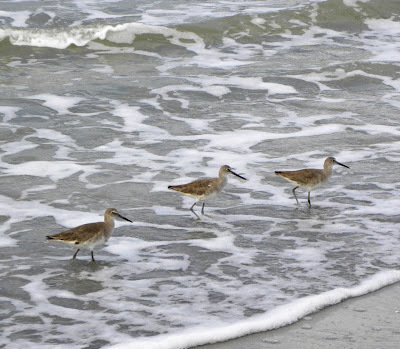 Since I had my camera, I took a picture of the Willet playing in the surf. The shelling started slowly, but picked up as we headed up the beach. We found very colorful specimens - mostly bi-valves. My bucket was about half-full of shells when we headed back over the causeway towards Ft. Myers Beach. 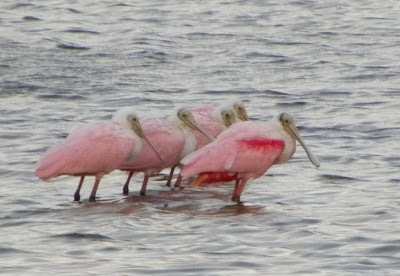 These Roseate Spoonbills were at Lover's Key. We got there early on two mornings and found buckets of wonderful shells. Even thought Sanibel is more famous for shelling - we both agree that there is better shelling at Lover's Key - especially early in the morning when the tide is low and the moon is new. 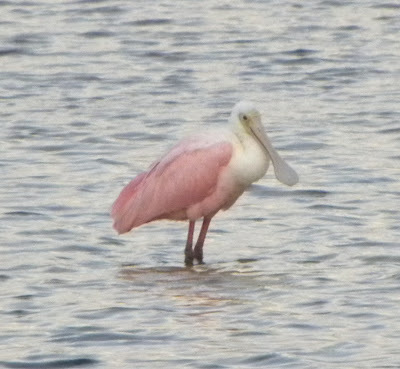 The Spoonbills feed in shallow water by wading and moving their open bills back and forth. They enjoy small fish, shells and insects. One rainy afternoon while Beth and Warren were getting caught up on chores at their apartment, Bill and I ventured out - between the raindrops to walk the trail at Six-Mile Cypress Slough. This youngster was swimming near the outlook on the main lake. I took lots of pictures as I had little clue what he was! 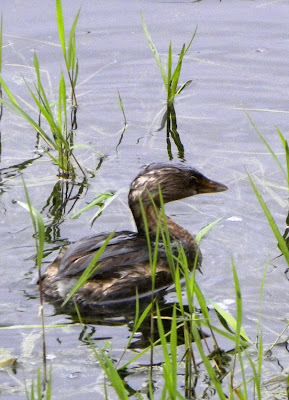 My first thought: immature Pied-billed Grebe - but there were no adults around. He was swimming with two adult coot when we began our walk and was still with them when we returned later. 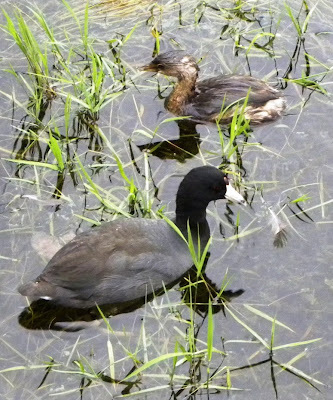 I checked my books and, sure enough, the immature coot look very different than their parents. If I had seen his feet, that would have made the identification definite as coot do not have the duck-like webbed feet - but the heron-like 3-toes. 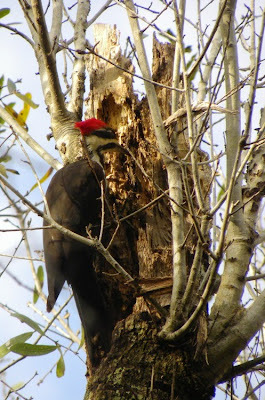 It's always a good day when I get to see a Pileated Woodpecker! This is Bill's favorite picture - adult alligators. There is nothing more I can say! Yesterday, Jet Blue carried my son John away from the snow and cold in New York City to sunny (but chilly) Ft. Myers. We picked him up at 7 p.m. He's here for the holidays but I'm letting him sleep in this morning before beginning another set of adventures. Stay tuned.